England Boxing have called for Gafur Rakhimov to resign as President of the International Boxing Association (AIBA) after the International Olympic Committee (IOC) launched an inquiry into the governing body and froze planning for the sport at Tokyo 2020. In a letter addressed to Rakhimov and seen by insidethegames, England Boxing chairman Caspar Hobbs claimed the "leadership of the organisation needs to be considered" and that it was "time for you personally to think about the actions you can take to help resolve the issues faced by the sport and address the specific concerns raised by the IOC". The IOC publicly stated for the first time last week that Rakhimov, who remains on a United States Treasury Department sanctions list as "one of Uzbekistan's leading criminals", was one of the major problems the organisation has with AIBA. IOC President Thomas Bach admitted his inability to "exercise his full function" as President of AIBA owing to his inclusion on the list, which prohibits travel to certain countries, was a key concern. 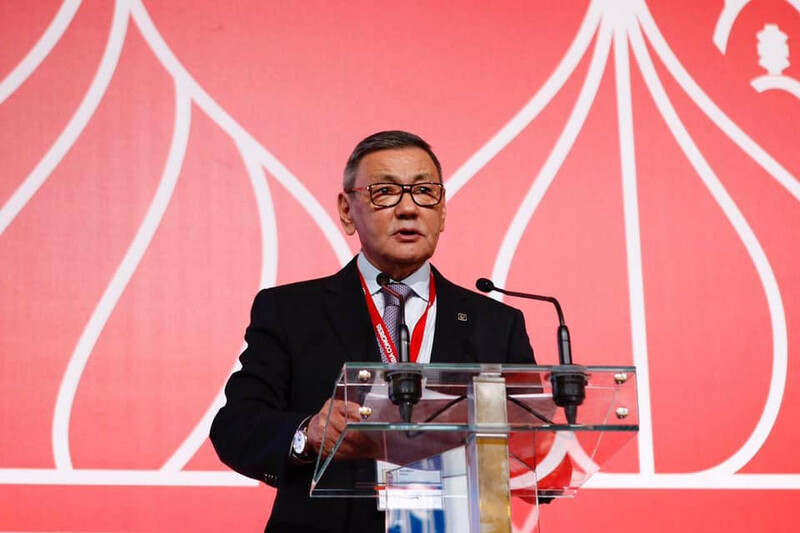 Rakhimov, elected AIBA President against the wishes of the IOC in Moscow last month, has previously hinted he could stand aside if the problems with the IOC continue. The Uzbekistani official has promised he will not jeopardise boxing's Olympic future but has given no indication that he plans to step down. In the letter, Hobbs also urges AIBA to "publicly demonstrate that it recognises the gravity of the situation and has a wide-ranging, detailed and transparent programme of reform to address the issues raised by the IOC". The embattled governing body has claimed in statements that AIBA has made improvements in governance, judging and finances - three of the areas of concern outlined by the IOC - since Rakhimov became interim President in January of this year. But England Boxing have cast doubt on the assertions made by AIBA, claiming it is "clear that these measures have not been sufficient to address the deep-rooted issues that exist". The national federation claim "a far more detailed and wholesale review of the way the international governing body operates is required if we are ever to restore confidence in the organisation". "The IOC has been clear and explicit about its major issues and has identified governance, leadership, ethics and financial management as significant areas of concern, so I am writing to you to ask for AIBA to provide clarity on its plans to address these," Hobbs adds. 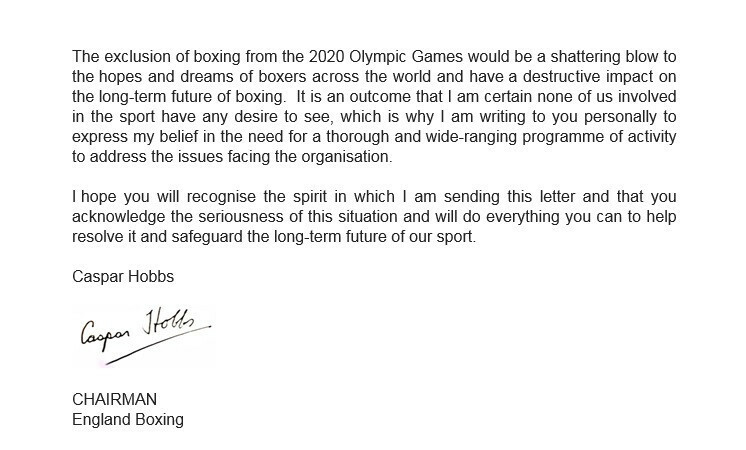 Hobbs writes that the IOC's decision to freeze planning for the 2020 Olympic boxing tournament was an "extremely worrying development" which has the potential to have a "devastating impact on both the long-term health of the sport and the hopes and aspirations of boxers in England, and across the world, who have spent years working towards the dream of competing at the Olympic Games". Bach assured athletes an Olympic boxing competition will still take place at Tokyo 2020, claiming the IOC "wants to have a boxing tournament at the Games in Tokyo and we will make all efforts to have it". But the statement from the IOC Executive Board has caused concern in the amateur boxing world as final confirmation on whether there will be an Olympic boxing event - and who will organise it - is not likely to be made until the Session in Lausanne next June, just over a year before the start of Tokyo 2020. There is also not yet a qualification path in place for athletes. A committee tasked with leading the inquiry, which could lead to AIBA losing the right to organise the Olympic boxing tournament, will conduct the investigation over the coming months before reporting its findings to the Executive Board. The inquiry, led by IOC Executive Board member Nenad Lalović, will assess the concerns raised by the IOC. "I hope you will recognise the spirit in which I am sending this letter and that you acknowledge the seriousness of the situation and will do everything you can to help resolve it and safeguard the long-term future of our sport," Hobbs writes. 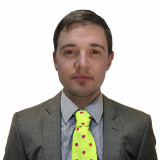 insidethegames has contacted AIBA for a comment.